The Fitness Center at Western Wisconsin Health is open to the public and equipped and staffed to accommodate any fitness level or plan. *Note: While our intention is to always be staffed at the above times, on rare occasions (weather, staff illness) we may be unstaffed with short notice. How do I get access to this WWH Fitness Center Online Portal? A WWH Fitness or Pool Member must receive their unique member number ID (different from the access card number), from the WWH Fitness Center Front Desk. You may do so by calling (715) 684-1642 or by stopping into the Fitness Center during staffed hours. The fitness center is available to members with key cards 24 hours a day, 7 days a week. Come in during staffed hours to sign up for a membership and purchase a key card! Age 16 and above may utilize the space without any restrictions and may receive 24/7 card access. Age 12-15 must be accompanied by a Parent/Guardian who is a Member during staffed hours only and have restricted access to certain equipment. Personal Training: Prices vary, please speak to staff. The UCan! The UCare Activity Network is a fitness program for UCare for Senior members who belong to the Fitness Center. These members qualify to receive a reimbursement of $20 each month per individual. (No minimum number of visits is required each month). Silver&Fit is a fitness and healthy aging program designed to help you achieve better health through regular exercise. This program is available for seniors (ages 65+) with Health Partners Insurance. Please see the fitness staff or contact your insurance company to see if you qualify. Western Wisconsin Health offers one-on-one or group personal training services. The components of our one-on-one personal and small group trainings are muscular strength, muscular endurance, body composition, cardiovascular endurance, flexibility, power, skill, and speed. No matter which personal training option you choose, be confident we will keep you motivated, accountable, safe and experiencing new challenges. Training sessions are one hour in length and can be as low as $20 per session depending on the total amount of sessions purchased. A free one time consult is available to determine which training package is right for you. Please call 715-684-1642 to schedule your consult or for more information. Please check out our events calendar for information on current class offerings and pricing. Beginning June 18, 2018 all fitness classes are included with a Fitness Center membership. Various programs will be offered periodically throughout the year at an additional cost. Click here to view the May class schedule. For more information on fitness classes, please call 715-684-1642. 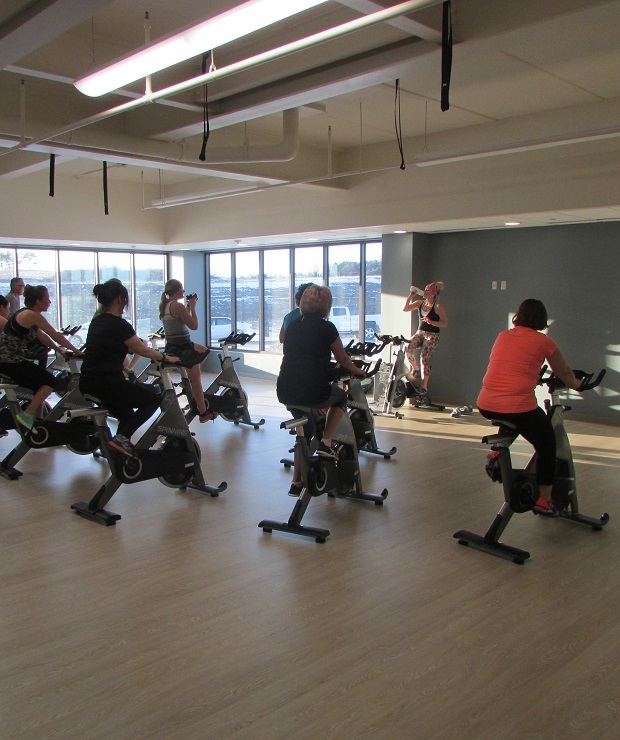 The fitness center has a 1,500 square foot fitness studio that is a separate enclosed space so class participants can have the privacy they need to exercise comfortably. This includes a variety of equipment for our members to utilize including spin bikes, aerobic steps and risers, exercise balls, medicine balls, BOSU ball, yoga mats, plyometric boxes and dumbbells to add some variety to your workout! Work out longer and consistently with an instructor leading the way. A well rounded exercise program consists of three components: flexibility, strength and endurance. 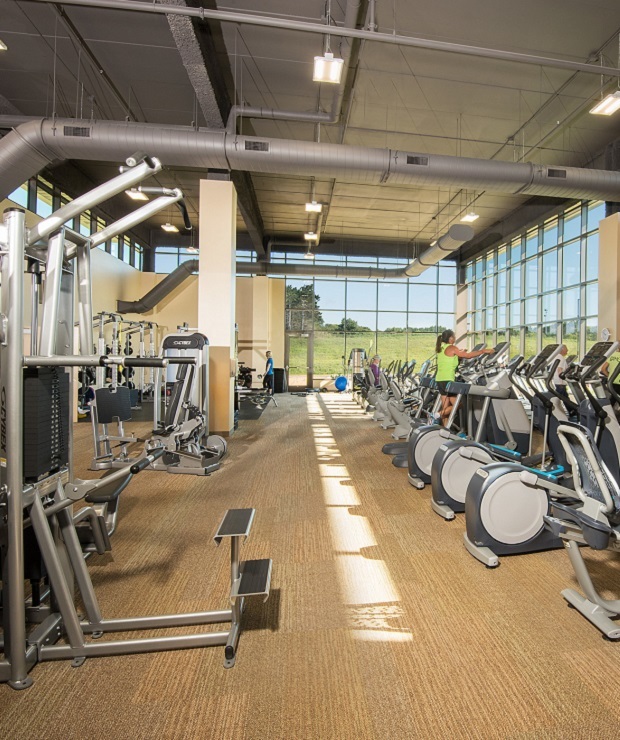 The Fitness Center at Western Wisconsin Health is equipped with new cardio and strength equipment throughout the facility to provide you with numerous options to meet the goals of all three components. Trained exercise instructors will work with you to design and monitor a program that will be enjoyable for you to perform and help you achieve your fitness goals, whether it is to be stronger, more flexible, lose weight, off season sport conditioning or run a marathon. The benefits of strength training go beyond big muscles. Strong muscles can help you lose weight, protect your joints and back from injury, boost your self esteem and keep you heart healthy. The fitness center has 15 strength training stations and a variety of free weights to help you become and stay strong. The Fitness Center has a variety of aerobic exercise equipment consisting of treadmills, exercise bikes, elliptical walkers, nu-steps, stair steppers, rowing machines and more. This offers you a wide variety of exercise equipment to avoid boredom with any one exercise, yet help you achieve your fitness goals. If we are unable to properly staff the playroom, parents will not be able to utilize it at that time. Every effort will be made to send an email to all parent/guardian members to let them know in advance if we are unable to staff the playroom on any given day. Monthly rate of $10/1st child and additional $5 for each additional child after the 1st. Ask us about our Playroom Member Volunteer program. 1 Parent/Guardian must be a fitness center member to utilize the playroom and parents/guardians may not leave the fitness center department at any time while their children are in the playroom. 75 minutes is the maximum amount of time a child can be in playroom per day. Children will be signed in and out when using the playroom. Parents/guardians who do not return within 75 minutes on more than 1 occasion will forfeit their ability to utilize the playroom for their children. We do not change diapers or help children in the bathroom. We suggest that you have your children visit the restroom prior to checking into the playroom. You will be paged if your child has a dirty diaper or needs to use the restroom.